This blog post is sponsored by The Network Niche and Uncle Ben’s. All opinions are my own. You know why I love having my kids help cook in the kitchen? Because not only is it fun to have them around, helping to create new foods and new memories, but they also get to experiment with new tastes and textures, and it gets them trying healthier foods! 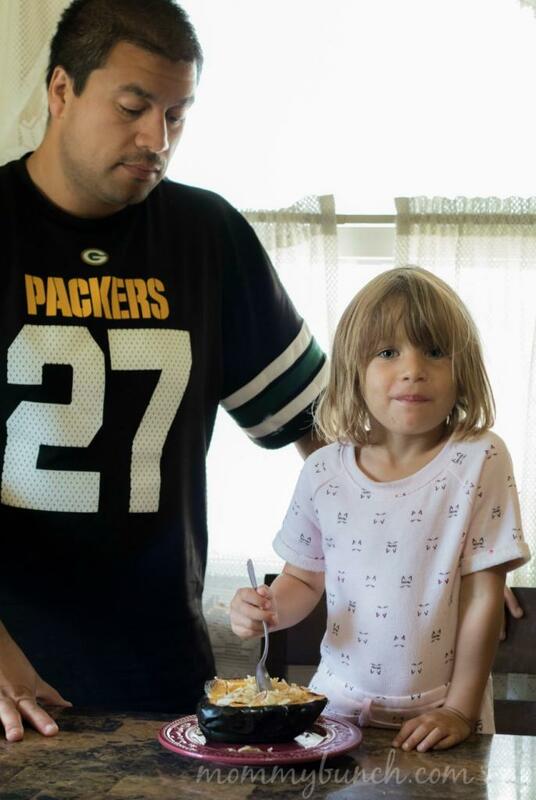 My kids have always wanted to help out with the cooking and I’m happy to let them. 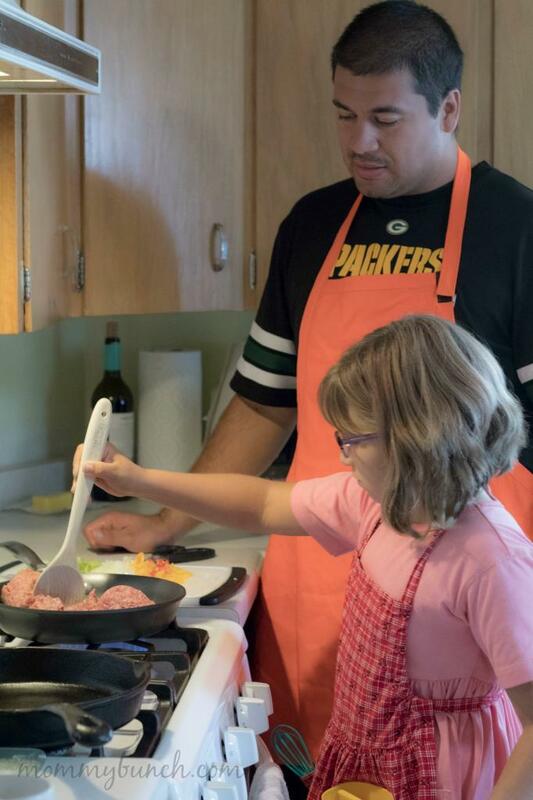 Teaching them techniques and the how-tos of cooking like measuring, chopping, adding flavors with things like onions, peppers, and celery, and really understanding more about the foods they are eating is something that is hopefully creating memories, and skills, to last a lifetime! With four kids at a wide range of ages, there is always something someone can help with. From knife and frying skills for the older kids to scooping out seeds or adding cheese for the little kids. Everyone gets a task, and everyone gets to enjoy some quality family time. Our most recent dish was stuffed peppers and stuffed acorn squash. My youngest daughter absolutely loves acorn squash and asks for it all the time, so she was thrilled to be able to help make this dish! 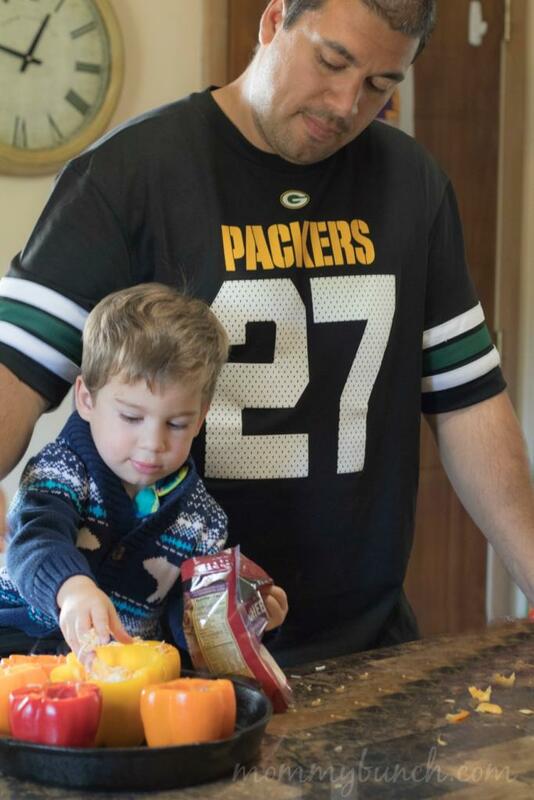 My youngest son was the official “taste-tester” and was snacking on raw peppers, raw carrots, cheese, nuts, and anything he could get his hands on as we were prepping the dishes — which to me is fantastic, because not only is he getting healthy foods, he is trying new flavors every time we make a dish together! 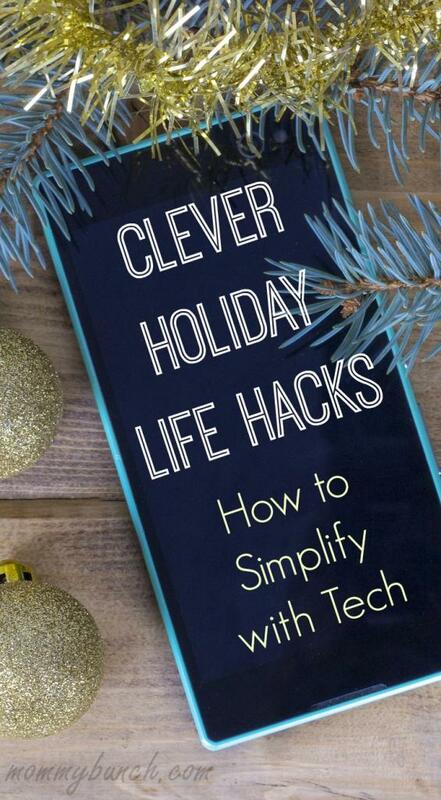 While these recipes sound like they could be complicated, they are actually quite simple. 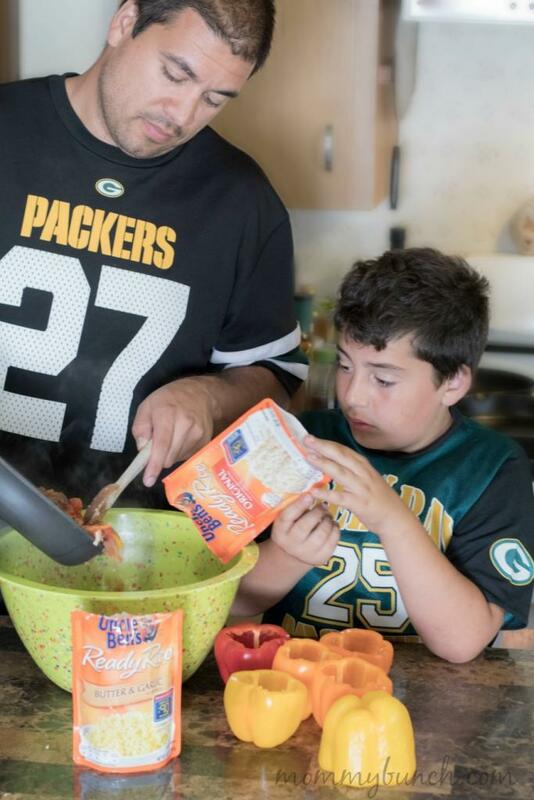 With a little help from Uncle Ben’s Butter & Garlic flavored and Original flavored Ready Rice, we are able to have the kids help with all the prep and cooking, and dinner is a cinch! Making these peppers couldn’t be easier. Simply chop up your favorite veggies — we used sweet peppers, celery, onions, and pre-julienned carrots. Add the veggies to a frying pan along with a pound of mild or sweet sausage and fry until the sausage is cooked and the vegetables are tender. While the sausage is cooking, prep your whole peppers by slicing off the tops and removing the seeds from the inside. Set aside until ready to be filled. When the sausage is fully cooked, add a can of diced tomatoes, including the juice, and heat through. Once everything is heated, in a separate bowl mix together the sausage mixture with your cooked Uncle Ben’s Ready Rice. At this point simply fill your peppers half full with the sausage and rice mixture, add some shredded cheese, then fill to the top and add more cheese to finish it off. We let my youngest add the cheese and he was absolutely elated to have a job and get those peppers full of cheese! Bake until the peppers are soft and the cheese is nice and melted and brown on top. Chop up your favorite veggies. Add the veggies to a frying pan along with a pound of mild or sweet sausage and fry until the sausage is cooked and the vegetables are tender. Mix the sausage mixture with one bag of Uncle Ben's original flavor ready rice. Fill your peppers half full with the sausage and rice mixture, add some shredded cheese, then fill to the top and add more cheese to the top. Bake in a 400 degree oven for 15 minutes, then reduce the heat to 325 degrees and continue cooking for 15 more minutes until the cheese is browned and the peppers are soft. I’ll admit, acorn squash used to terrify me. I never really knew what I was supposed to do with them until one day my daughter saw them in the store and asked to have one. Who was I to deny her a fantastic vegetable (really a fruit since it has seeds, but who is counting)? We picked a couple up, I roasted them with a little butter and maple syrup, and haven’t looked back since! They truly can be a wonderful addition to any meal and they are a lot easier to make than I was originally worried about. What I do is slice them in half — they can be a little tough to get started so be sure to use a sturdy knife and take care when cutting. This would not be a job for kids since it can be a little tricky. Once you have two halves, I also slice a little sliver of the flesh off the back of each side just so they lay flat on my baking sheet. A good job for younger kids is to scoop out the seeds. Once the seeds are removed, I take a knife and poke holes all around the inside of the squash, taking care not to pierce the outer flesh. Then I generously butter all over the inside and spread some maple syrup all around. 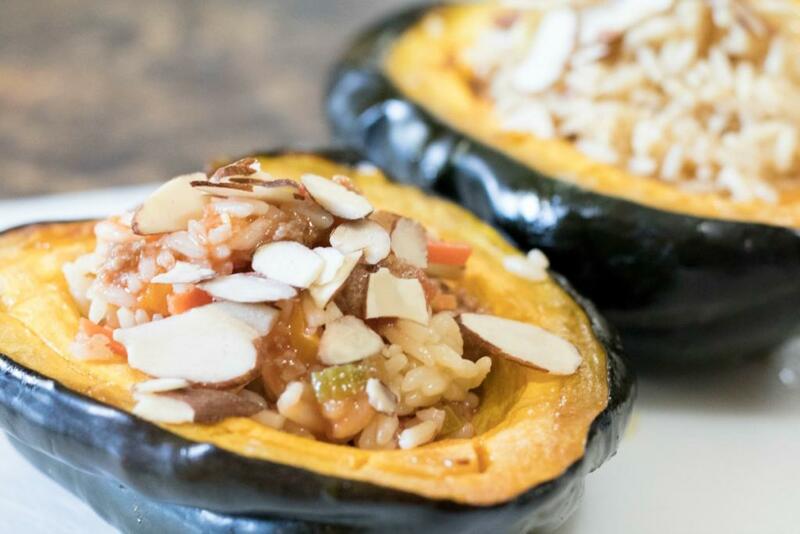 Bake the squash for 40 minutes in a 400-degree oven, then fill with Uncle Ben’s Ready Rice (flavor of choice), some slivered almonds, and if desired, any remaining stuffing mixture from your peppers. 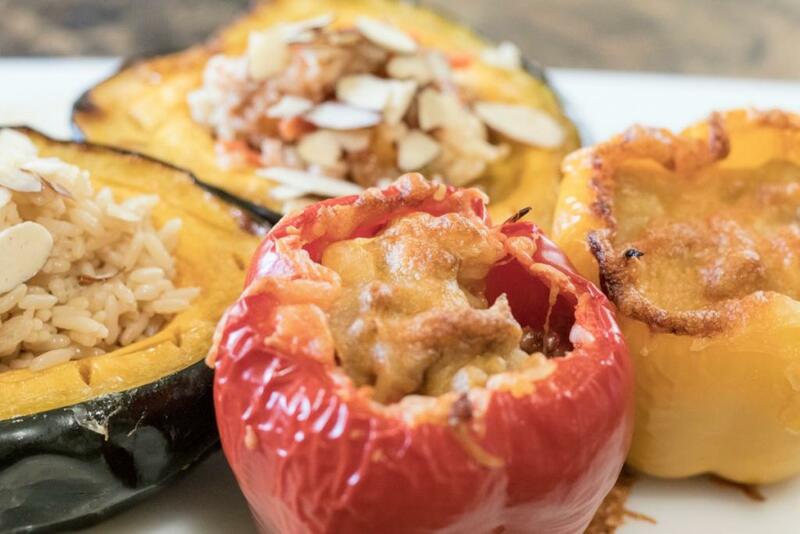 With Stuffed Peppers and Stuffed Acorn Squash, your meal is complete in one easy step (bake them both at the same time and you are done)! Ready to cook with your own kids? 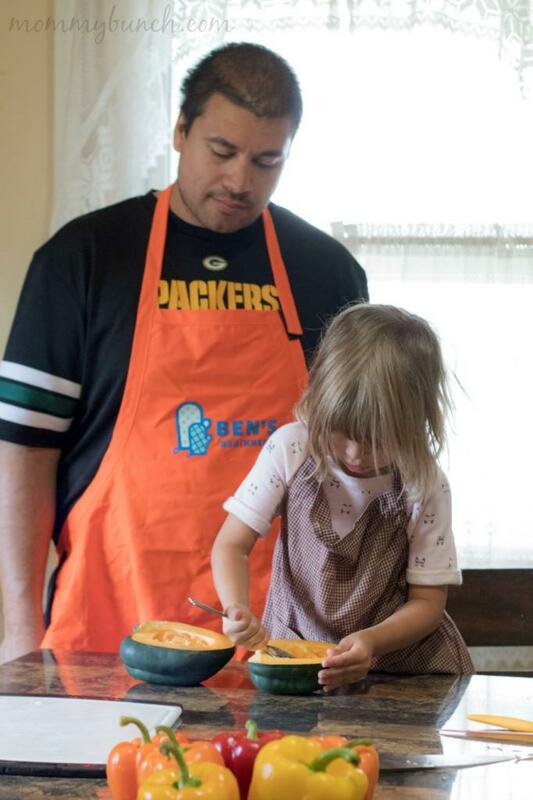 Uncle Ben’s Beginners cooking contest, now in its sixth year, has teamed up with Tiffani Thiessen to inspire families to spend more time together in the kitchen. 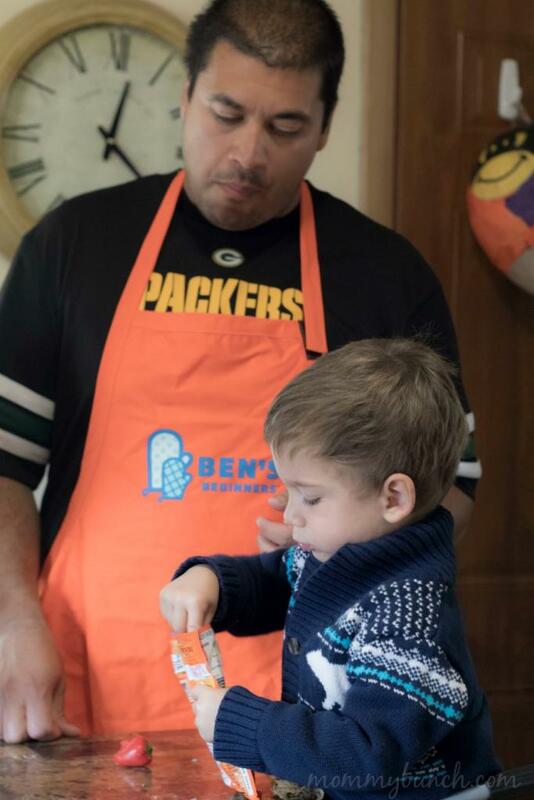 The BEN’S BEGINNERS™ program is part of a movement driven by the UNCLE BEN’S® Brand to help kids learn the essential life skill of cooking as well as they learn how to read and write. 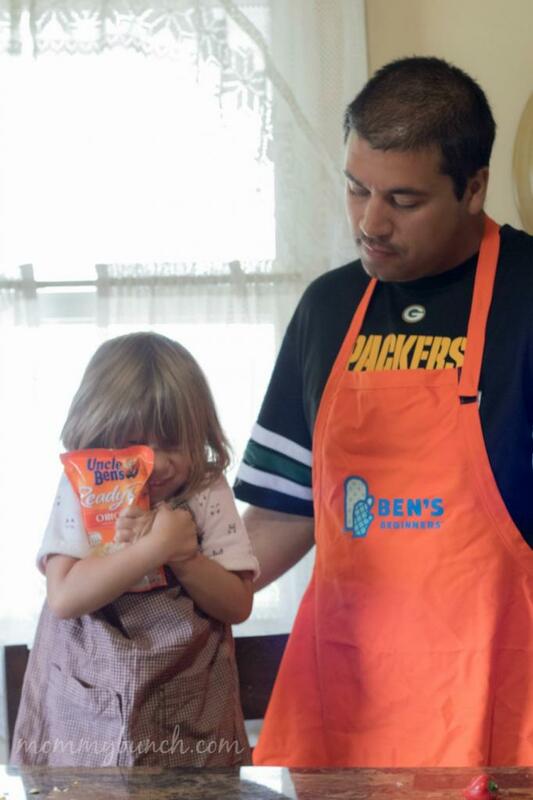 Since launching in 2012, the UNCLE BEN’S BEN’S BEGINNERS™ program has motivated thousands of families to cook together and has donated $715,000 to children and schools across the country to create healthier local communities. Parents with kids in Kindergarten through eighth grade can submit a photo of their family preparing a rice-based dish together using #BensBeginners. 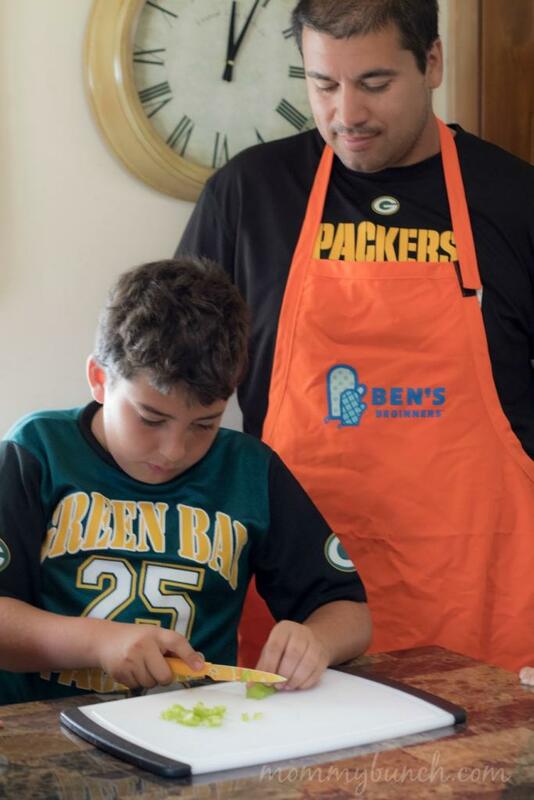 Participants in the BEN’S BEGINNERS™ Cooking Contest will enter for the chance to win one of five Grand Prize packages, which includes $15,000 cash, a $30,000 cafeteria makeover for their child’s school and a hometown celebration. Submissions will be accepted on unclebens.com until 11:59 p.m. ET on October 9, 2017.